Beer and steak... what more could anyone really ask for? This recipe is a popular choice because most people typically have the ingredients on hand in order to make this simple grilled steak. The enzymes in the beer will actually break down the fatty tissue contained in the steak and the result will be a more tender piece of meat that will melt in your mouth. The type of beer you use to marinate your steak with is your choice, but we recommend not using a light beer. Light beer will not impart as much flavor as a darker beer. We prefer to use a lager, ale, or dark stout beer that will provide you with a bold flavor that is sure to please. Poke holes in your steaks by using a fork. This will help ensure the beer marinate and seasonings will penetrate the center of your steak. Combine all of your steaks and seasoning ingredients in the large bowl or zip-lock bag to marinate. We recommend marinating for at least 4 hours or as long as overnight in the refrigerator. The longer you marinate your steak in beer, the more tender your grilled steak will be. Remove the steaks from the marinate and pour the leftover marinate in a saucepan on your range. Heat the marinate on the range and bring it to a boil. Lower the temperature and let it simmer for 5 minutes. You will use this leftover marinate to baste it on the steaks during the grilling process. Preheat your grill for direct grilling and medium-high heat. Place your steaks directly over the flame on your preheated grill and grill for 7 minutes on one side. Make sure you turn (not flip) your steaks 45 degrees at 3 1/2 minutes in order to ensure even cooking and create a cross-hatch pattern like a professional grill master. Once your 7 minutes is up, flip the steaks over and drizzle some of the hot marinate over the top of the steaks. Don't use too much or you will drip the liquid on the flame of the grill. After cooking on this side for 7 minutes, your steaks will be ready to take off the grill. Remember to turn the steaks 45 degrees one more time at 3 1/2 minutes. 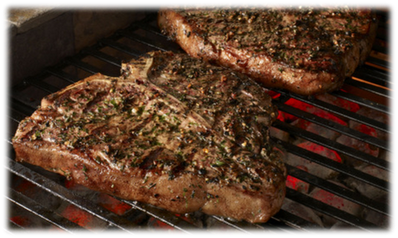 Steaks are one of those grilled items that can range in terms of doneness. Most grill masters will ask their guests how they want their steak cooked and there is a range from rare to well done that is typically used to determine the degree of doneness. One nice grilling tip is to use the steak doneness test to figure out when to pull your steaks off the grill. You always want to avoid cutting into a steak to determine if it is done, because this will cause your juices to escape the meat and make it much more tough.